The best handguns for women often land outside the pink-it and shrink-it category. What are some great general handguns for women? Confession: My name is Kat, and my hands aren’t small. My fingers are longer than those of many — most — men, in fact. My palms are too wide for women’s gloves. My hands engulf sub-compact guns but fit full-size double-stack 10mms. I am a woman who shoots, and my hands are neither small nor weak. Men frequently ask me what handgun I recommend for the female in their lives. My standard response: Let them choose for themselves. With that said, here’s a list of top handguns for women. And keep in mind: Many of the top choices don’t sport pink grips or purple slides. When Smith and Wesson launched the M&P45 Shield in 2016, I was immediately intrigued. The M&P Shield is a striker-fired model offered in multiple calibers — 9mm, .40 S&W, .45 ACP — that’s earned a well-deserved place at the self-defense table. The .45 ACP chambering is interesting, partly due to the challenge of controlling its recoil in a compact model. The 45 Shield was designed with an aggressively textured grip to combat slipping; even pouring water over the gun didn’t lessen its effectiveness. It has an overall length of 6.5 inches — 0.4 inch longer than the smaller caliber models — and weighs 20.5 ounces empty. As a single-stack, it’s easier to conceal and simpler to grip with smaller hands while remaining comfortable for larger hands. On the range, its design proved solid by recoiling rearward with minimal muzzle rise. My average five-shot groups at 10 yards hovered at 1.5 inches and expanded to 2 inches at 25 yards. Why conceal carry (CC) a .45 ACP? Because its bullet diameter is .451 inch prior to expansion, after which it’s even larger, and sometimes those extra two millimeters are the difference between hitting and missing vital organs or arteries. Many carry advocates shy away from recommending .45 ACP handguns for women because they believe they recoil enormously, which isn’t true: The .45 ACP recoils more than some, but it’s far less than most people expect. It’s easily mastered, and when you do, you might find yourself not only carrying the 45 Shield, but also loving it like Gollum loved the One Ring. Frame with Slide Stop: 1.05 in. The Ruger SR1911 in 9mm is a Series 70 Lightweight Commander-style 1911; this variant has an aluminum frame and 4.25-inch barrel. At 29.3 ounces, it’s somewhat heavier than the original Colt Commander of 1949 and longer, too; its overall length is 7.75 inches. Even so, it can be concealed — yes you can conceal a full-size pistol — even as a smaller-framed woman. Slinging lead, the SR1911 excels. It ships with Novak Low-Mount three-dot sights; sights are drift adjustable and provide a clear sight picture. But its true test wasn’t at my hands but those of my then-13-year-old daughter, Grace. She was a 1911 newbie, and her first five-shot group at 10 yards neatly obliterated the 1-inch bull’s eye on the Shoot-N-C target. Grace’s hands are much smaller than mine; her fingers are 1.75 inches shorter and narrower, too. Despite that, we both found the Ruger SR1911 offered a positive grip, natural trigger reach and fantastic accuracy. At 25 yards using Hornady American Gunner XTP 115-grain ammunition, the gun nailed a best five-shot group of 1.41 inches. It’s a dependable, accurate gun, and Grace claimed it as hers. Oh, the SR1911 is also available in 10mm. The 10mm model has a longer barrel and is difficult to conceal, but it’s a superb choice for open carry or handgun hunting. It’s awesomely precise — my first five rounds of Polycase yielded a one-hole .538-inch group — and it feels natural. Also, its greater recoil is blunted by its design. My first range session with it involved 100 rounds of Hornady and 200 rounds of Polycase. There were no failures, just pure precision and bliss. If you’re interested in the SR1911, be aware that it comes chambered in 9mm, .45 ACP and 10mm. Trigger Pull: 4 lbs., 5 oz. The SIG P320 received attention after being selected as the winner of the Army’s XM17 Modular Handgun System (MHS) competition. It then failed a drop test done outside U.S. testing parameters; basically, it might fire if the trigger has a heavier pull and it’s dropped in a specific way. SIG announced it will offer upgrades, but here’s the bottom line: The P320 has been reliable not only for myself but other long-time gun owners, meaning it’s highly recommended. During trigger time, the striker-fired P320 shines. It has a wider double-stack grip that fits both large and smaller hands — mine larger and Evans’ smaller — and texturing assists a firm grip, making it one of the best handguns for women available, or anyone for that matter. There’s some take-up ahead of the break; the trigger breaks at a measured 6 pounds, 3 ounces. At 25 yards, the best group was with DRT 9mm 85-grain Terminal Shock, a five-shot 1.11-inch group. The P320’s modularity is one of its greatest features: Grip modules come in small, medium and large; it has an interchangeable trigger group; and calibers include 9mm, .357 SIG, .40 S&W and .45 ACP. The full-size P320 has an overall length of 8 inches and an empty weight of 29.5 ounces; the Compact model has an overall length of 7.2 inches and an empty weight of 25.8 ounces. Whether for open carry, concealed carry or range time, SIG has you covered here as a woman who shoots. Big Green recently celebrated its 200th anniversary, and with it came the RP9. There might appear to be similarities to the aforementioned P320, but there are reasons to mention it. In just a few short years, Remington jumped in the deep end of the handgun pool, launching the R51 — twice — the RM380 and the RP9. Of this trifecta, all of which I’ve fired at length, the RP9 stands out as the model of choice when it comes to handguns for women. It takes more than going “boom” for a gun to win me over. So, although its aesthetics are noteworthy — it looks cool — it’s the trigger that makes this gun. The RP9 has a safety blade trigger with a steady, smooth pull and clean break. The reset is short, simplifying follow-up shots and increasing accuracy. My Lyman Trigger Gauge measured its pull weight at 5 pounds, 10 ounces, and though I do enjoy lightweight triggers, the RP9’s does nicely. Five rounds of Polycase Inceptor 9mm 65-grain ARX pierced a target at 25 yards with a best group of 1.67 inches. Trigger Pull Weight: 5 lbs., 10 oz. Its bold purple slide grabs your attention, but the accuracy of the Kimber Amethyst Ultra II keeps it. The Amethyst is a compact 1911, and if you doubt the platform’s efficacy, consider that a 1918 Colt M1911 was self-defense expert Massad Ayoob’s 12th birthday present. If a 1911 can win the attention of 12-year-old Mas, it can have yours, too. The Amethyst comes in 9mm and .45 ACP, so I, of course, chose .45 ACP. I ran 10 different brands of ammo through the pistol at various distances and experienced no failures of any kind. It’s a single stack, so it’s slim for small hands, but the G10 grip panels broaden the gun for a concrete grip. Even better, it’s tall enough to prohibit dangling pinkies; it has an overall height of 4.75 inches and a 3-inch barrel, but it manages to retain enough bulk for comfortable and decisive shooting. The solid aluminum trigger has an extremely abbreviated measured pull weight of 4 pounds, 10 ounces, and a glass-sharp break. At 10 yards with Snake River Shooting Products Team Never Quit 155-grain HP Frangible rounds, my best five-shot group — offhand — was 0.58 inch. At 15 yards, I had no problem drilling the bull’s eye consistently with a single-handed grip. The Amethyst is a reasonably light 25 ounces, empty, and it’s highly concealable. My one issue was the beavertail grip safety, which began pinching the pesky skin between my thumb and pointer finger during extensive shooting. Otherwise, it’s a well-made, high-quality pistol. At the range, several men referred to it as “cute,” which they quickly swapped with “amazing” and “I want one” after I let them try it. There’s nothing cute about a precise compact 1911; it might be purple, but it’s a stellar self-defense weapon. Kimber also offers it as the bright-blue Sapphire. Trigger: 4 lbs. 10 oz. What’s a gun list without Glock? Sadly lacking, in my opinion. Eleven years ago, when my daughter was three years old, my concealed Glock 27 saved both our lives. I still own that gun, a little pistol that’s proven its reliability through thousands of rounds and concealment in a long list of states throughout the country. It cycles in sub-zero weather, rips out the bull’s eye whether I’m 15 yards away shooting one-handed or firing prone — and feels good in my hands. There are several versions of the sub-compact, or baby, Glock. The more popular models are the 9mm 26, .40 S&W 27, 10mm 29, and .45 ACP 30S. The .40 S&W is losing popularity partly because ballistics has improved the 9mm’s capabilities but also due to a lack of knowledge. No matter how you slice it, the .40 S&W has an edge in velocity, energy and, subsequently, a bigger wound cavity over 9mm. As mentioned earlier, one millimeter could be the hair’s breadth to drop your attacker. I would be remiss not to address this cartridge. Glocks are striker-fired polymer pistols, and the majority are double-stacks. The 27’s overall height of 4.17 inches leaves my pinkie hanging; Pearce Grip Extensions on magazines solve the issue without interfering with concealment. Hornady Critical Defense 165-grain FTX fired offhand at 10 yards produced a best five-shot group of .49 inch with the 27, and I shot a .53-inch group with the 26. The sub-compact 27 recoils more than full-size pistols, but it’s still negligible, and muzzle rise is easily managed. The stock safety-blade trigger has some take-up and a clean, firm break. It has a tactile reset; if you pay attention, follow-up shots are fast, without take-up. There’s no arguing the reliability of Glocks, and if there’s one thing required of a self-defense gun, it’s that. There are numerous options for caliber and size. If you prefer single stacks, there’s the .380 ACP 42 and the 9mm 43. There are sub-compacts, compacts and full-size models; Gen 4 Glocks ship with interchangeable backstraps. Glocks might be plastic, but they’re plastic I trust with not only my life, but also my daughter’s. Trigger pull: 5 lbs., 2 oz. Length of twist: 9.84 in. If the name doesn’t get you, this custom 1911’s performance will. Republic Forge is known for its high-end 1911s, which are handmade one at a time. I’ve had the pleasure of using various models for hunting and self-defense, and I consider the Defiant a must-mention. Yes, it’s an expensive pistol, but it’s also an impressive weapon. 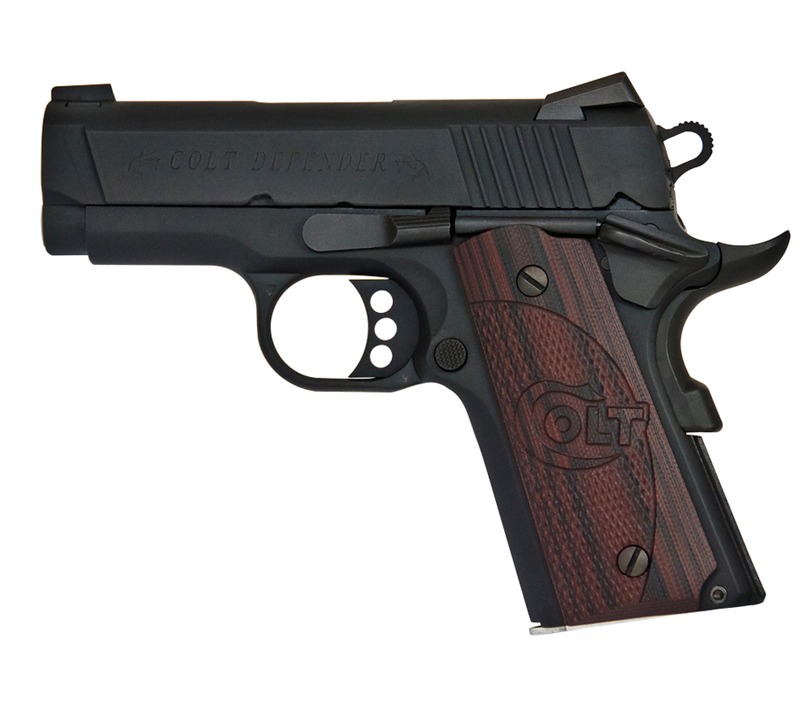 The .45 ACP Defiant is a Commander-style 1911 designed to become the classic in your gun family. Don’t misunderstand; this is no safe queen. With a barrel length of 3.6 inches and an overall height of 5.25 inches, it can and should be your EDC. Its skeletonized trigger has a measured pull weight of 3 pounds, 1 ounce and offers a consistent pull and crisp break. Muzzle rise is minimal, and it provides a positive grip; all controls are within reach for shooters with smaller hands, and the grip safety functions well. It ate everything I fed it from hollow points to frangible ammo, and it produced a best five-shot group of 1.22 inches at 25 yards with Polycase Inceptor 118-grain ARX. If you want a custom-made 1911, Republic Forge gets it done with Made-in-America style. The Defiant is one of many outstanding options. Trigger Pull: 3 lbs., 1 oz. You probably noticed these guns are all 9mm and larger. Despite advances in ballistics, tests — including my own — show .380 ACP doesn’t meet FBI standards for penetration. This doesn’t mean it should be discounted, but that it’s best as a BUG (backup gun). In fact, the Ruger LCP II is one of the more impressive pocket pistols of recent history with its vastly improved trigger and surprising accuracy. It’s a great boot gun and executes tight groups at close range. The .380 ACP is a snappy little cartridge meant for close-range use; the belief that .380 ACP, .38 Special and other small calibers produce less felt recoil is patently untrue. There’s a gun for everyone regardless of hand size, stature … or gender. Try different models before choosing one — let the lady of your life try them for herself — and don’t restrict her to smaller calibers. Handguns for women do not automatically translate to micro-sized .380s. Buy the gun she’s comfortable shooting and willing to carry, then get proper training. Editor’s Note: This article is an excerpt from the September 2017 issue of Gun Digest the Magazine. Kat Ainsworth is a contributor to Gun Digest the Magazine.